For all the things that my son refuses to eat, there is one that he craves and asks for specifically. No, it's not mac n' cheese nor grilled cheese sandwiches (although he does have a preference for them...). Rather, he truly enjoys Korean BBQ. 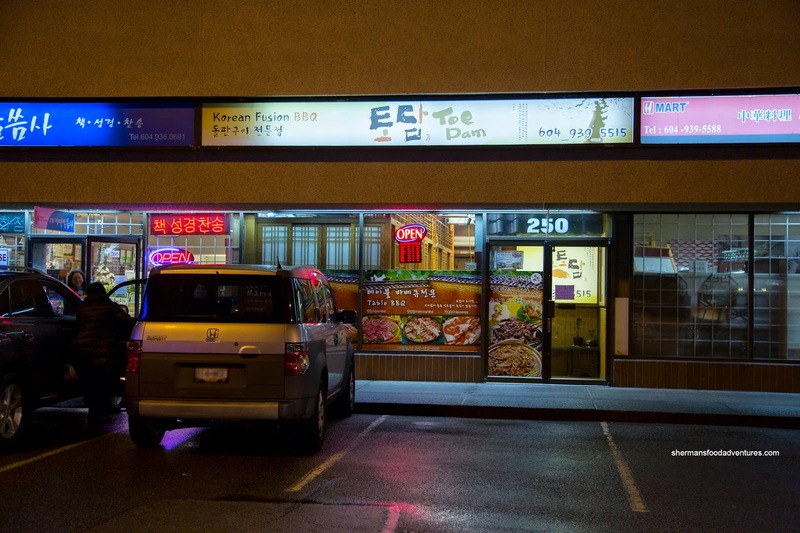 Great, expensive tastes since Korean food can be pretty pricey. That was essentially the case time around as we hit up Toe Dam located near H-Mart and amongst many other Korean restaurants. It was funny how the kids kept thinking it was called "toe jam". Anyways, everything hit the table at the same time and in the bustle, I didn't notice that we only received 4 small plates of Banchan including sprouts, seaweed, kimchi and potato. I wished that there was more variety and more in portion size (but then again, we could've asked for more). We liked the kimchi as it was crunchy and had a bright tart spiciness that wasn't heavy. 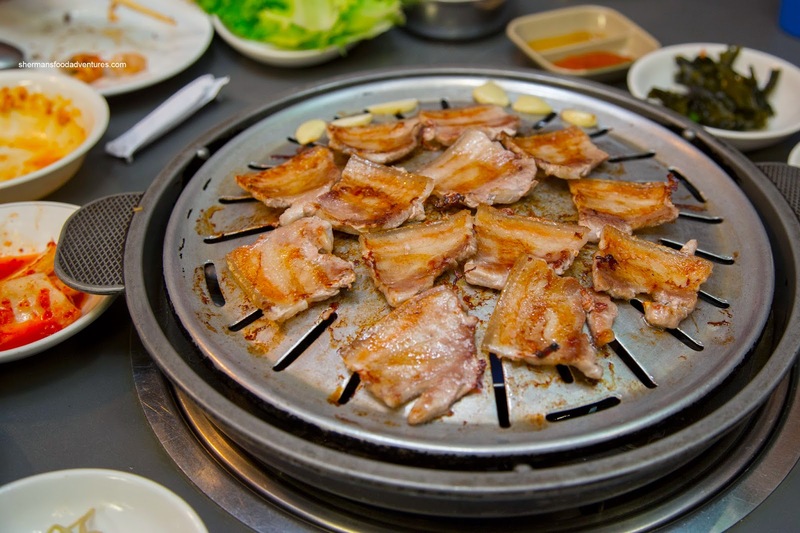 As for the BBQ, we started with the Pork Belly which sported a good meat-to-fat ratio. After being crisped up on the grill as well as caramelization, these were predictably tasty where the kids gobbled them up. For us, we did the ol' lettuce wrap with garlic and soy bean paste. We also got an order of the marinated Short Ribs which were thick and succulent. They were well-seasoned exhibiting the classic sweetness. If you were wondering about the scissors, they were necessary to cut up the meat once we finished grilling it whole on the BBQ. 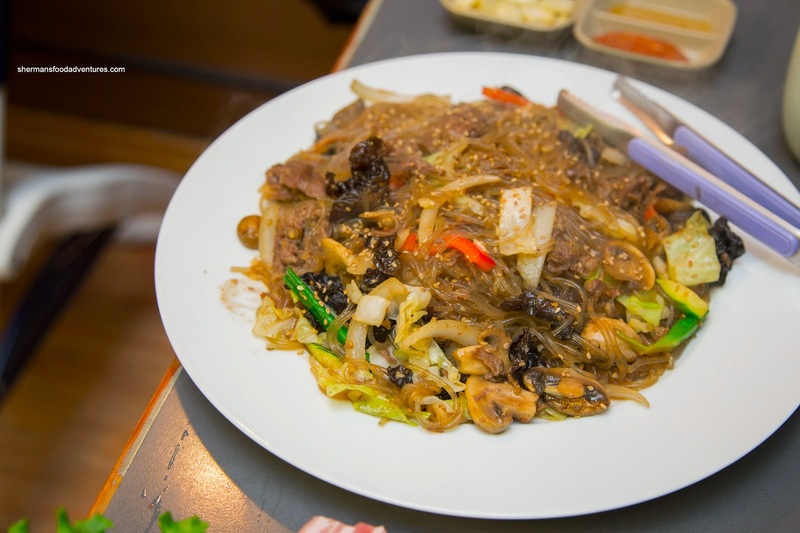 For the kiddies, we got an order of the always expensive Japchae (which baffles us as we prepare it at home at a fraction of the cost). We liked it as it was very garlicky and not overly soft nor wet. 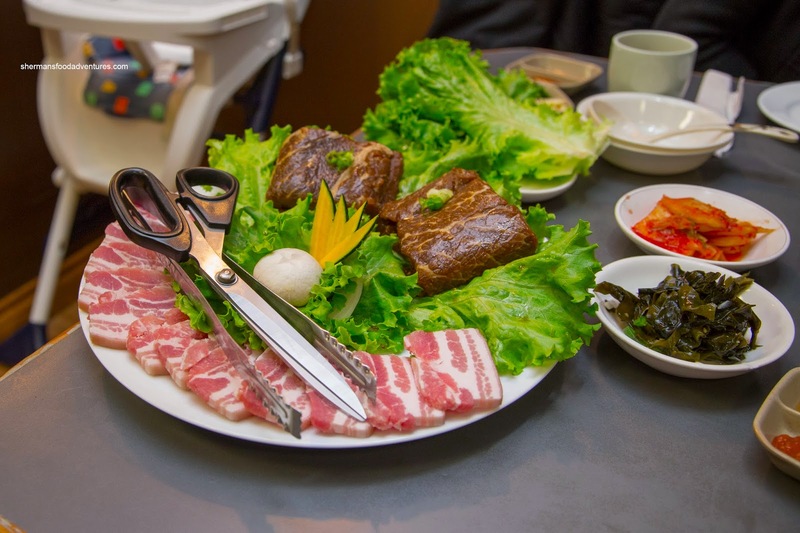 There was no shortage of ingredients including big pieces of tender shaved beef. There was also a noticeable sesame oil essence which was appetizing. 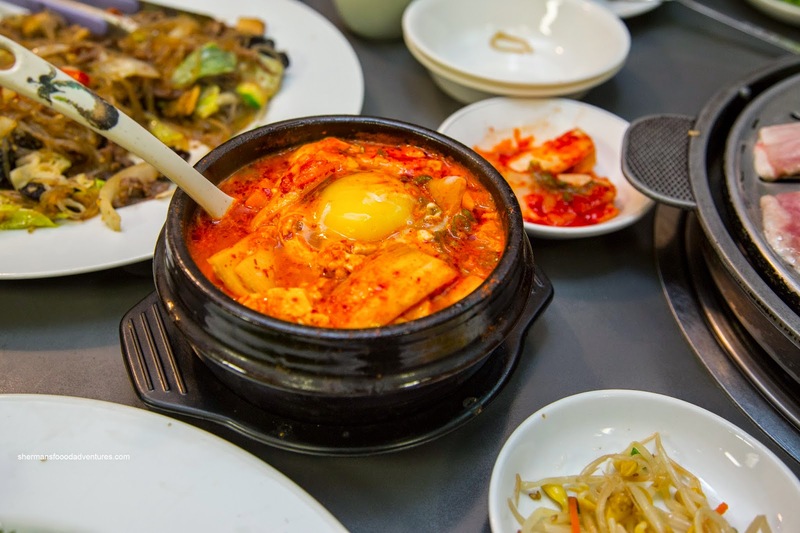 Lastly, we had the Tofu Soup which was full of ingredients including silky tofu, shrimp, kimchi and raw egg. This was very thick and somewhat spicy. In reality, it was more of a stew (in general that is) than a soup as it was hearty with more ingredients than actual broth. Overall, we enjoyed our meal at Toe Dam despite ringing up a bill over $80.00 for 2 adults and 2 young kids. 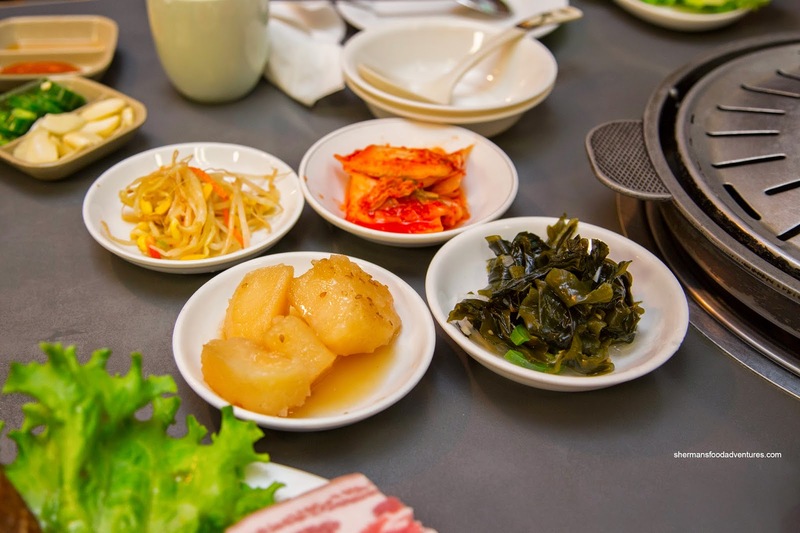 But that shouldn't be a surprise as eating at a Korean restaurant (in particular authentic ones) can be often a wallet-emptying experience.